The first time I heard of 'moo goo gai pan' said in American/English years ago, I had no idea what it was. Then I figured it out it must be chicken with mushroom, still took me many years later to figure out what 'pan' is in Chinese till I Google and found out it is 片(slices). This dish name has appeared in many American movies or tv whenever Chinese food is mentioned, even The Simpsons also talked about moo goo gai pan. 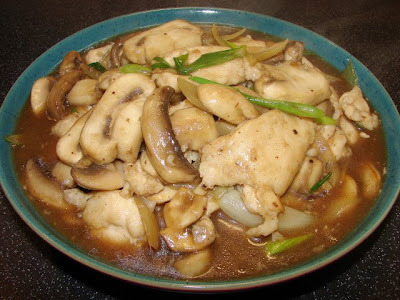 Moo goo gai pan is a favourite American Chinese (Cantonese) dish. This is also very popular in UK but I am not sure we called it 'moo goo gai pan' over here. This stir fry dish is quite tasty and easy to make. There is really no need to order from the Chinese takeaway (takeout) or restaurant. It's an everyday dish with simple and easy available ingredients. The way I like to make this is to velvet the chicken in hot oil to make the chicken pieces very smooth, tender and juicy. If you hate cooking the chicken in hot oil, you can just stir fry with a little oil like normal till the chicken is cooked. Velveting in oil, in Chinese is called 滑油 'wat yau' in Cantonese or 'huat you' in Mandarin, helps to seal and cook the meat very quickly so to seal in all the goodness and juiciness. So when this velveted meat is added to the stir fry this can cook very quickly. Velveting in oil is the most common and favourite method used in many Cantonese restaurants and takeaways (takeout) all over the world. Mix chicken with egg white, cornflour, salt and ground pepper. Leave for about 15 - 20 minutes. Heat oil in wok till very hot, then drop in the chicken. Be careful of hot oil. The chicken pieces may stick together, use a pair of long chopsticks or a tong to tease them apart. Cook in the hot oil briefly for only about 30 sec - 1 min max till chicken has turned milky white. Take the chicken out using a slotted spoon or spider skimmer. Leave the chicken to drain on the skimmer or large metal sieve. Remove most of the oil (for other uses) and leave about 1 - 2 tbsp in wok. While the wok is still hot, add in the garlic and onion, stir fry till onion has softened a bit. Then add mushrooms stir fry for couple of minutes, if the wok is very dry and beginning to get sticky and burning can add a touch of water, stir fry till mushroom is softened. Then add chicken pieces stir and add in the cooking wine, continue stirring till everything is hot then stir in the slackened conflour to make the gravy. Then add enough oyster sauce and ground pepper to taste. Finally throw in the spring onion.